So what is this Salli thing and how can it help me? A not so new way of "ergonomic" thinking. While they are quite recent to Australia, Salli have been researching sitting disorders and manufacturing high quality saddle chairs in Finland since 1990. This is no gimmick - with hundred of thousands of chairs sold around the world. Why do we say "ergonomic" rather than just ergonomic? Well, to be frank, the word ergonomic is overused and abused in attempts to make a regular chair seem better for you than it actually is - and to charge a premium price. The fact is that many of these so-called ergonomic office chairs will not help your back at all. How do we know this? Because just about everybody who buys a Salli had one of these ergonomic chairs. Hey, we agree! Sit stand desks are great! Looking at the image, the user is standing in a very relaxed position, the desktop is just below the elbows, the top of the monitor is at eye level. Her posture is great! This desk has a pocket cutout so she can support her elbows without reaching forward which can put extra strain on the shoulders. The problem with these desks is that their effectiveness is not fully utilised - nobody wants to stand up all day! Many users only stand for maybe 20% of the day, and some not even at all! Sitting is not the reason many people end up with back problems - sitting BADLY is. 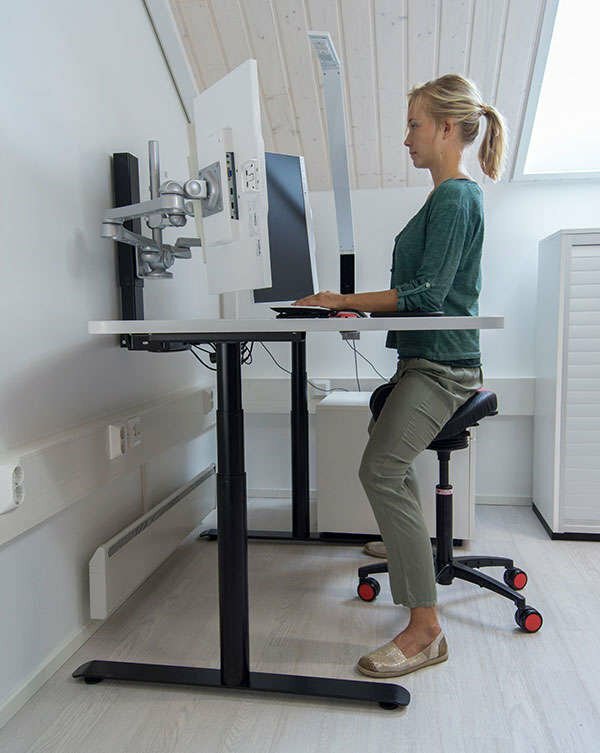 Supercharging the performance of your sit stand desk. Ok, so now in this next image we have the same user, and the same desk. The only difference is that she is now sitting a on Salli saddle chair. So what is the difference with standing? Unlike a regular office chair, with the Salli Saddle Chair, your body weight rests on the sitting bones. The lower back can therefore form a natural curve. The riding-like sitting position lets your back enjoy good posture without unnecessary muscle tension. As the load on the spine eases, the muscles in the neck and shoulder area can relax. The lower body forms a golden triangle: you are sitting on your sitting bones with your legs obliquely forward. Maybe we can show the benefits better in a video! So, are you interested in improving your posture and back health or taking your sit stand desk to the next level? Below are some of our most popular Salli chairs. If you have any questions please call us on 1300 048 112, chat live, or visit our contact page. The Swayfit comes with all the great features Salli has to offer - including active sitting adjustable width for extra comfort. The Sway is very similar to the Swayfit but it is a fixed width model. The Salli Dental is perfect for anybody, but has some features which are especially good for dent/medical environments. Our entry level model. 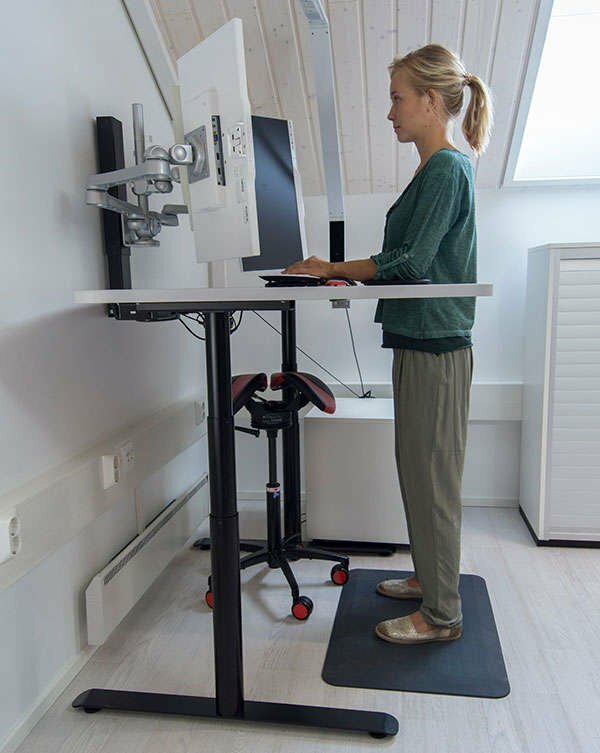 Provides excellent postural benefits with height adjustment. Not recommendedif you sit for long periods of time.